When you love someone, you take the good with the bad. 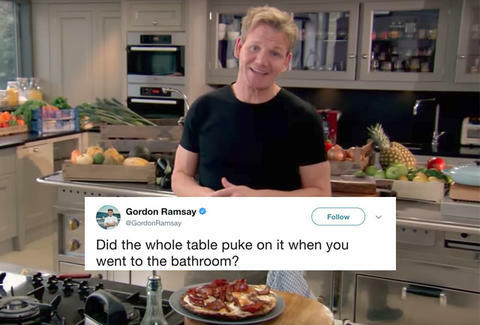 If you love Gordon Ramsay's cooking, you get the swear-y destroyer of cooking aspirations with it. Or, maybe, you're the kind of person who shows up for the soul-eviscerating criticism of chefs who aren't getting it right. If you fall into the latter group, Ramsay has a treat for you. He's back on Twitter tearing apart the home cooking of anyone willing to step to the plate. Tweet him a photo of your meal, and he'll let you know it looks like "spiced turds." That doesn't seem all that alluring on its surface, but people can't seem to resist putting themselves out there to be tormented by the Hotel Hell host. Here's how it goes pretty much every time someone steps up for their digital tongue lashing. The chef's insults even made this amateur cook delete a meal from the collective memory. If you require a palate cleanser, take a moment to remember that one time Ramsay said something nice. You can get a lot more of this when his new show, which sounds like Kitchen Nightmares-on-steroids, premieres. Until then, maybe you can try to soften his critical impulse by making his impressive egg and hash brown recipe. Also, that garbage burrito doesn't look too bad.